1. Walking on the toes; toe-walking; such as, a tip-toe gait which is common in toddlers in the first few years of life. Dactylograde, toe walking, is not unusual in younger children who are just beginning to walk and otherwise growing and developing normally; however, toe walking after three years of age should be evaluated by a doctor. 2. In zoology, an animal that walks on its toes; such as, a cat, a lion, a wolf, etc. ; distinguished from a plantigrade, which walks on the palm of the foot. The printed, or recorded, fingerprint. Someone who takes, or studies, fingerprints. A reference to the examinations and analysis of fingerprints. The scientific examination of fingerprints for identification purposes; literally, "finger writing". The study of fingerprints as a means of identification. Here are more details about the science of dactylography. 1. The developmental or acquired contracture or distortion of one or more digits. 2. The permanent contraction of the fingers. Having the appearance of a finger. 1. The study or use of the finger alphabet, as among deaf-mutes. 2. Talking" or communicating with the fingers and hands. 3. A method of communication used by deaf-mutes, involving symbolic expressions with the fingers and hands. 4. 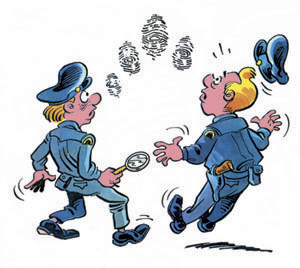 The study of fingerprints for purposes of identification: The following illustration provides evidence that dactylology indicates that a thief must be very large as shown by the size of the prints left by his fingers. The use of dactylology can provide evidence from a crime scene that an important method of forensic science, or the use of technical methods to solve crimes, can be utilized to find out who committed them. 1. The loss or amputation of a digit. 2. Dissolution of the bone of a finger. 3. The spontaneous dropping off of fingers or toes, seen in leprosy; and sometimes produced in utero (inside a woman's uterus or womb) when a hair firmly wrapped around a digit causes amputation. The spontaneous disappearance of fingers or toes, as with leprosy or ainhum (disease affecting the toes and sometimes the fingers). Abnormally large fingers or toes. The art of numbering, or counting, by the fingers. Historically, it was not just a matter of using the whole finger, as some people do in our modern times; but it was more complicated in that every finger was utilized for its knuckle, two joints and three bones (one joint and two bones for the thumb) and all of them, on both hands, were used to count up to 9,999. There are descriptions of the method from the Middle East, Asia, and other places. Paintings exist from more than four thousand years ago showing Egyptians counting in this way, and it was common in classical Greece and Rome. 1. Speaking with the fingers. 2. Expressing language with the fingers. Showing page 5 out of 12 pages of 180 main-word entries or main-word-entry groups.